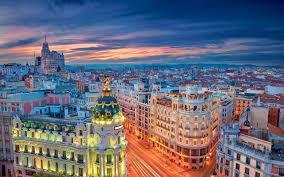 Madrid is the capital of Spain and the largest city in the EU after London and Berlin. It’s a city, celebrating its liveliness in arts, culture, food and nightclubs. Next to this, Madrid is one of the major financial centers in Europe and is home to various important international organizations. Madrid has one airport: Madrid Barajas Airport (MAD). The distance between the airport and the city center is 17 kilometres. Travelling by metro to the city center (station Puerta del Sol) takes 35 minutes. You have to change stations twice, at Nuevos Ministerios and at Tribunal or Plaza de España. For a ticket you pay €5.00 including €3.00 airport surcharge. Travelling by train to the city center (station Puerta del Sol) takes 30 minutes and you need to transfer at Chamartín or Nuevos Ministerios. The price of a ticket is €2.60. The last option is travelling by bus, which takes 30 minutes to get to the city center (Cibeles, Plaza de Cibeles). A single journey costs €5. Traveling within Madrid is easiest and fastest by metro, but bus and taxi are also great options. Madrid is not bicycle-friendly: there are few to no bike lanes. There are a few companies renting out bicycles and electric bicycles. Madrid has lots to offer in terms of culture, architectural highlights, food and art. Some of Madrid’s most exciting highlights are: Museo del Prado (museum), Plaza Mayor (square), Centro de Arte Reina Sofía (museum), Parque del Buen Retiro (garden), Museo Thyssen-Bornemisza (museum) and Plaza de Toros & Museo Taurino (stadium). Madrid is home to three UNESCO World Heritage Sites: Monastery and Site of the Escorial, University and Historic Precinct of Alcalá de Henares and Aranjuez Cultural Landscape. Last but not least, don’t forget to taste some of the amazingly delicious tapas in the La Latina district. Madrid is a very healthy city to go to, since it has the highest number of trees and green in Europe. Because of this there are lots of nice parks where you can take a walk or a run, for example: El Retiro Park, Parque del Oeste, Madrid Río, Juan Carlos I Park, Templo Debod and Casa de Campo Park.